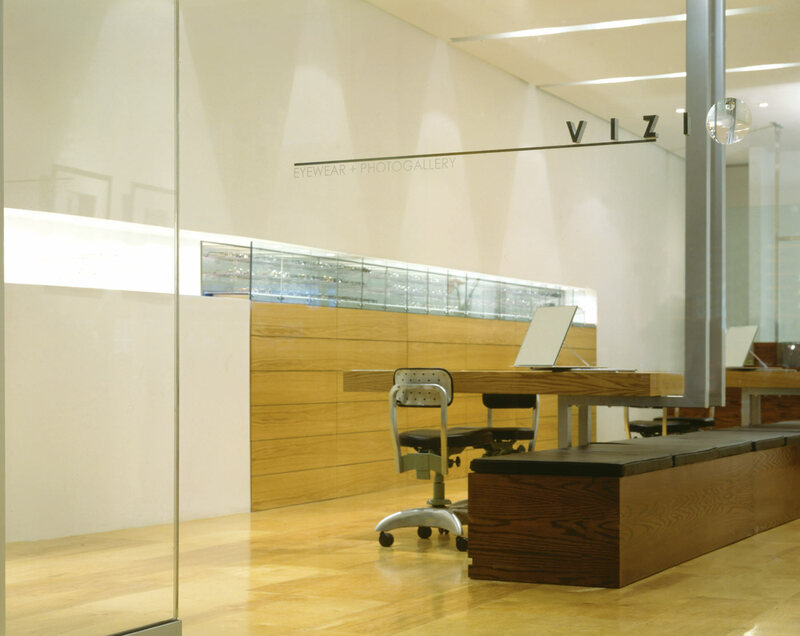 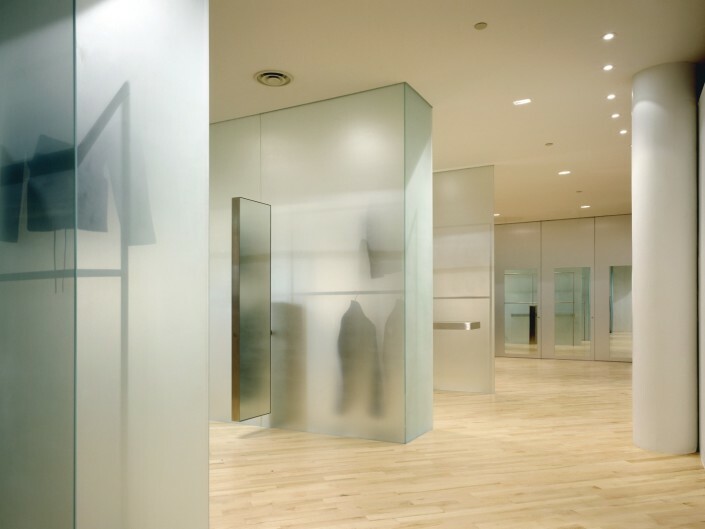 Located in Toronto Canada, Vizio Eyewear + Photogallery was designed for the dual purpose of functioning as an eyewear boutique and an art gallery exhibiting photographic work. 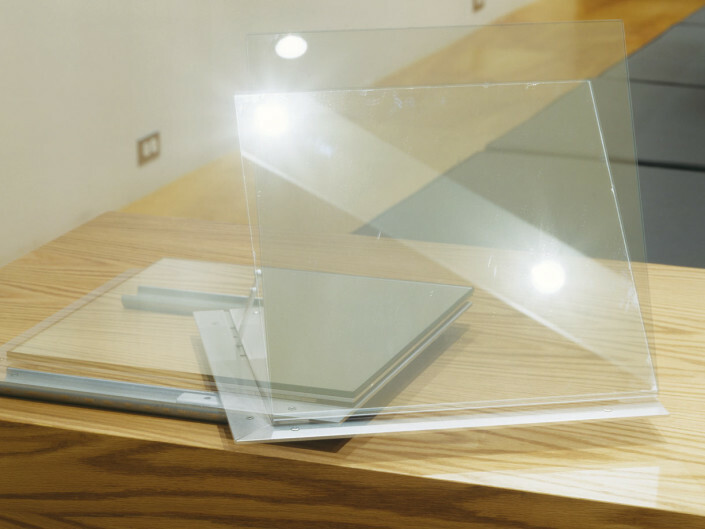 The combination of the two functions was intended to heighten one’s awareness of the act of viewing through a lens, either through eyewear or a camera. 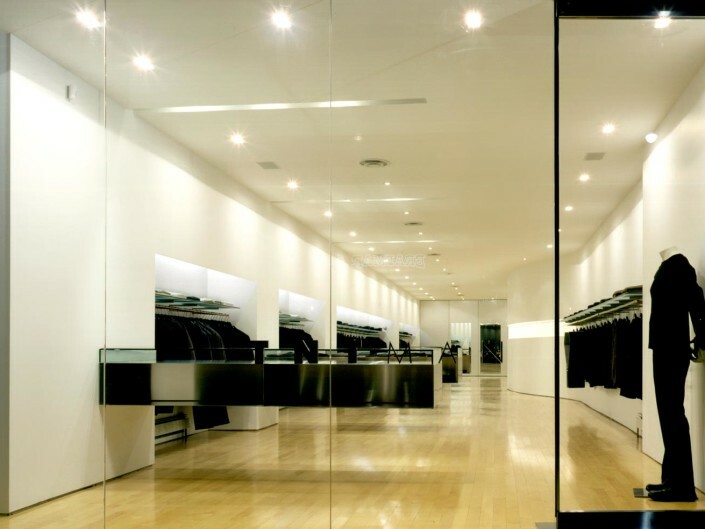 This unique coupling of programmatic functions inspired the concept for the boutique/gallery. 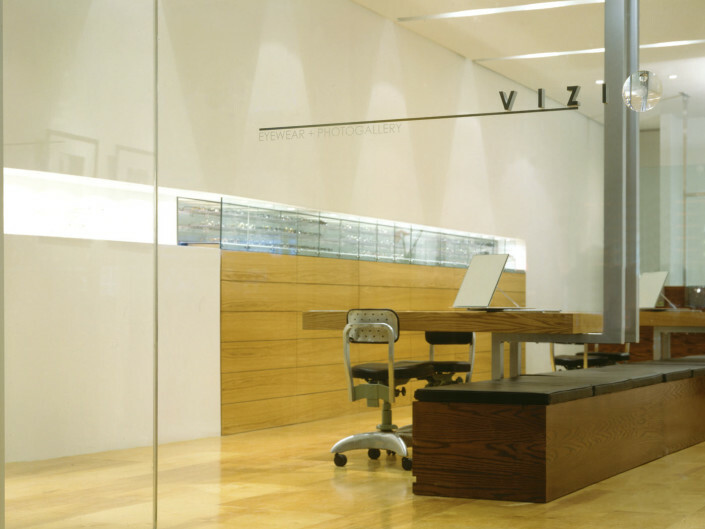 Forms and details were composed to evoke both the transformational and multi-use nature of the space and the mechanistic characteristics of eyewear frames. 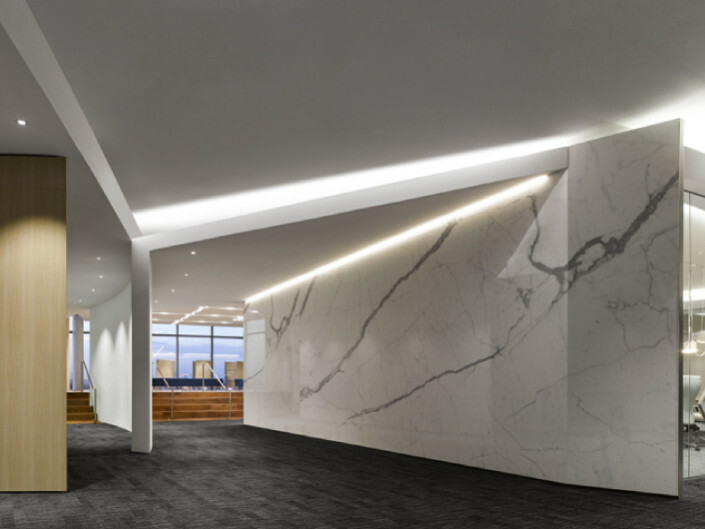 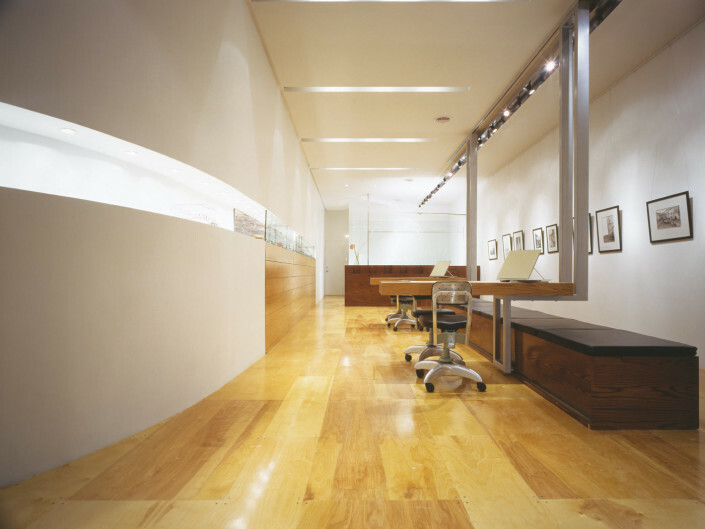 Elements that slide, tilt, and pivot, and a circulation path revolving around a gallery bench placed longitudinally in the centre of the space are designed to engage the customer/gallery patron. 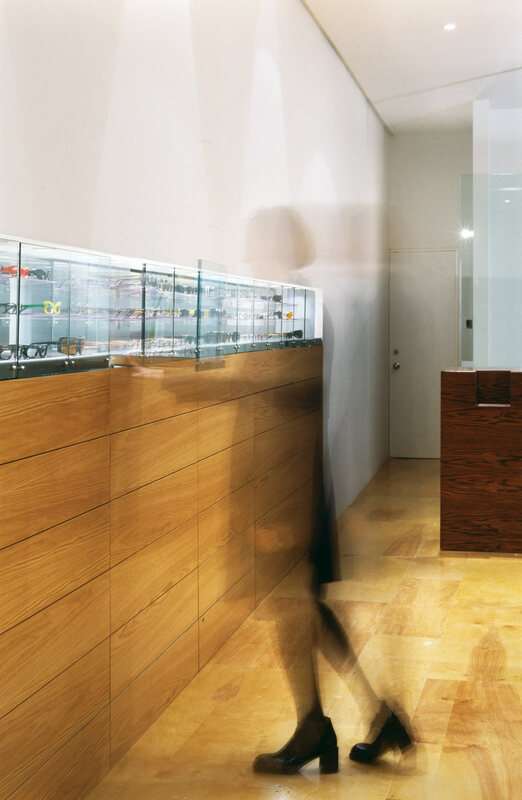 A curved wall with a brightly lit recessed slot for the display of featured eyewear was intentionally angled toward the exterior to function as a signboard to those outside the boutique/gallery, drawing viewers into the space. 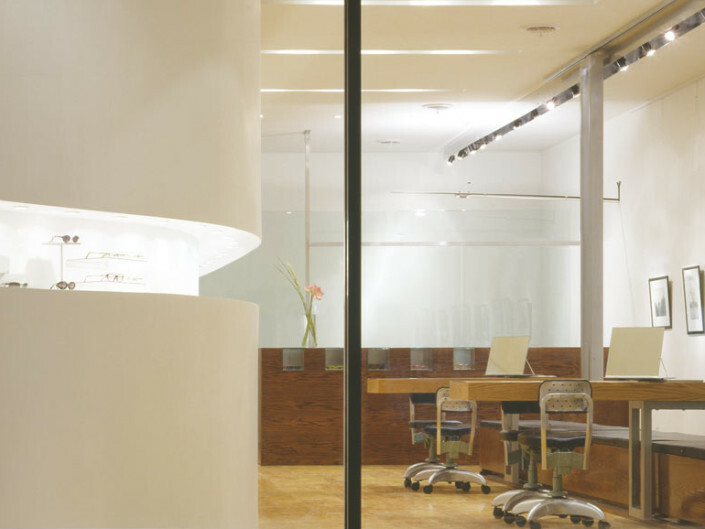 The conceptual basis for the main eyewear display was intended to create a conscious and deliberate sense of viewing and movement. 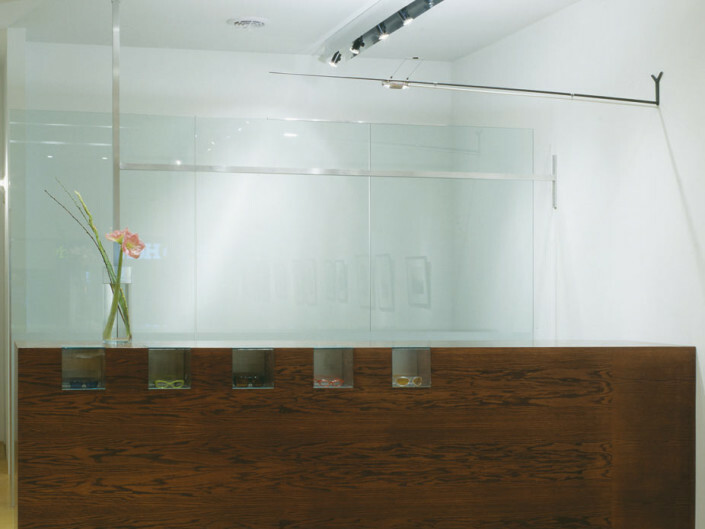 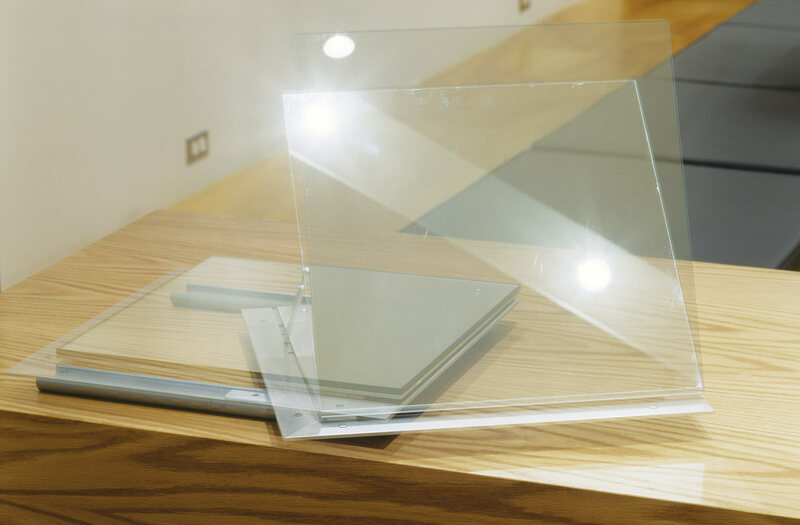 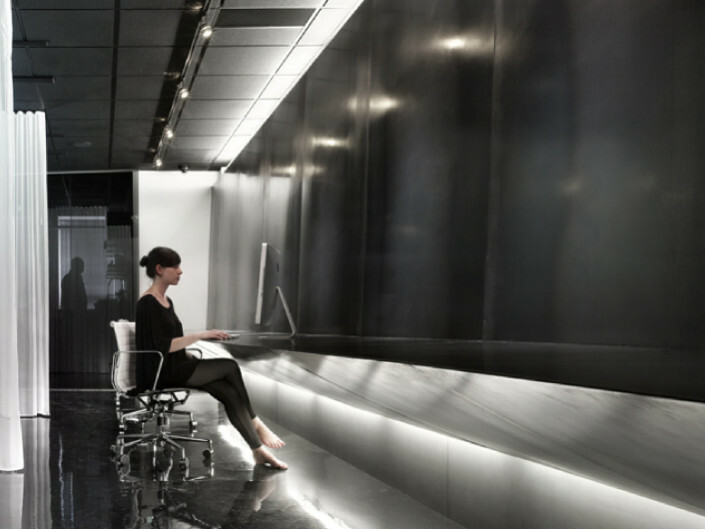 Comprised of stainless steel and glass, the touch-latch activated display trays are opened automatically to an ex-tended position by pressing against each glass front. 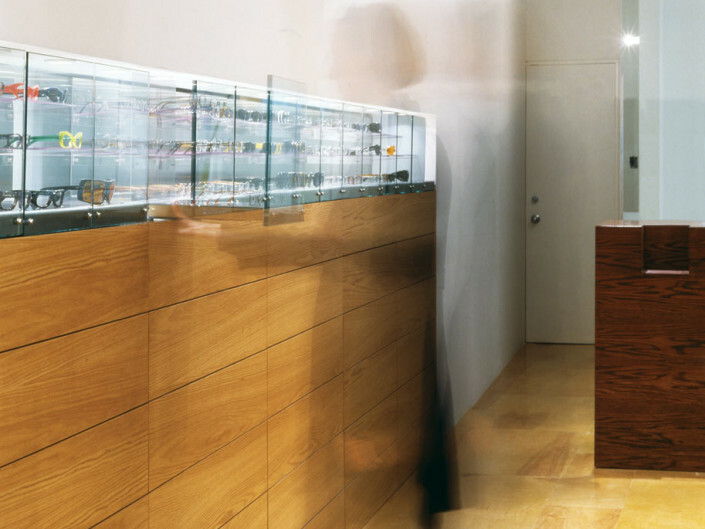 As the customer views one display to the next, they will be more likely to appreciate the eyewear at their own pace and not be overwhelmed by excessive selection. 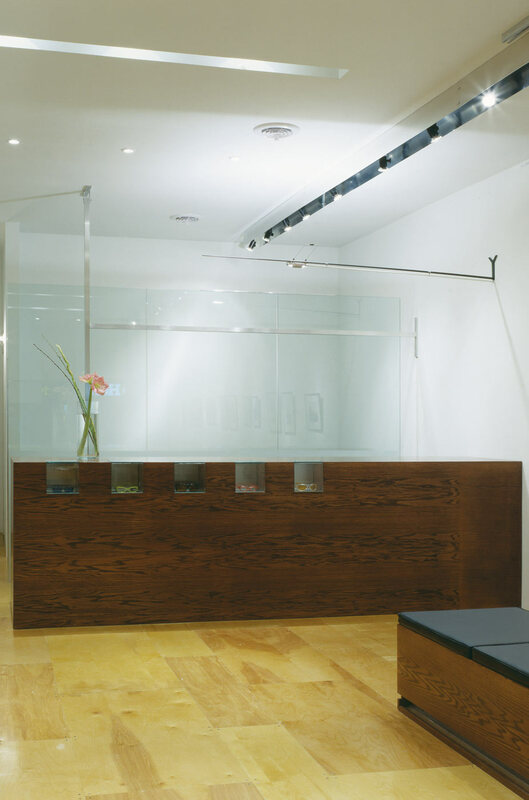 Situated longitudinally in the boutique/gallery, two customer service tables are suspended from a track that is fastened to the ceiling. 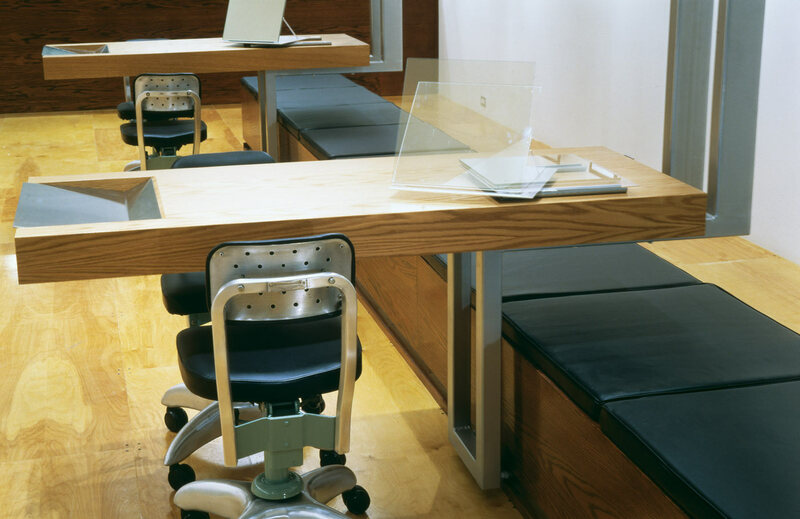 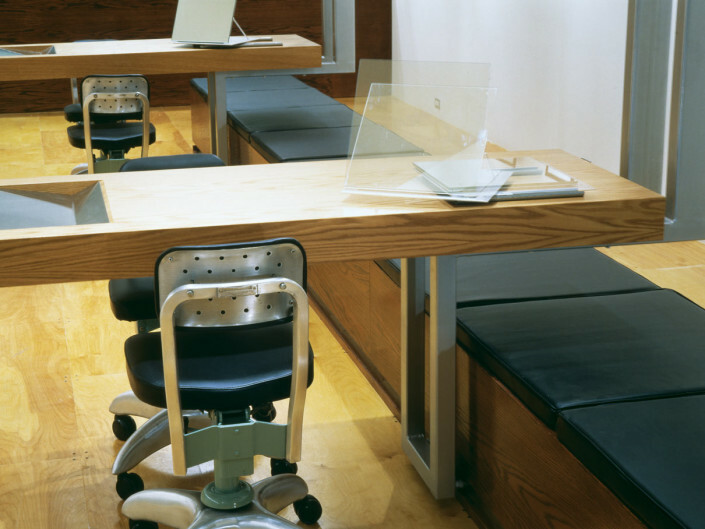 Functioning in tandem with a long gallery bench, the tables animate and transform the space. 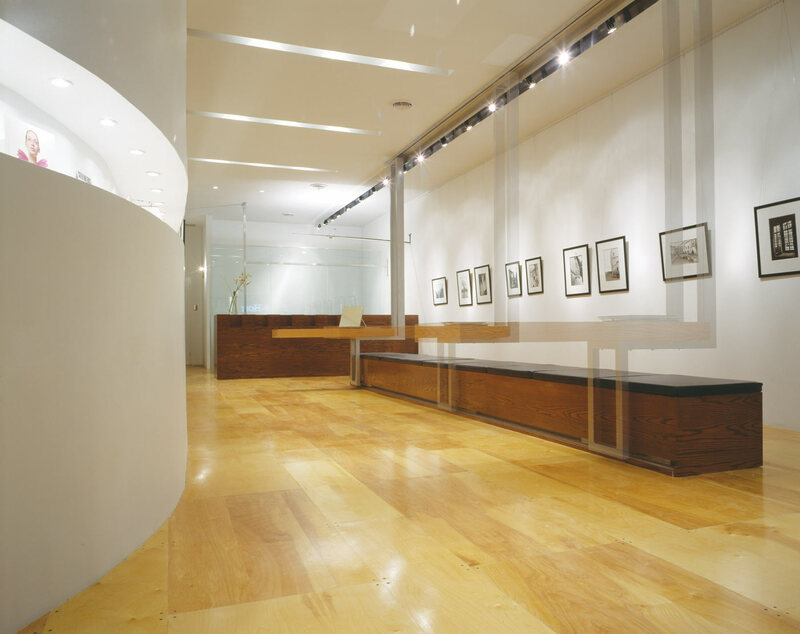 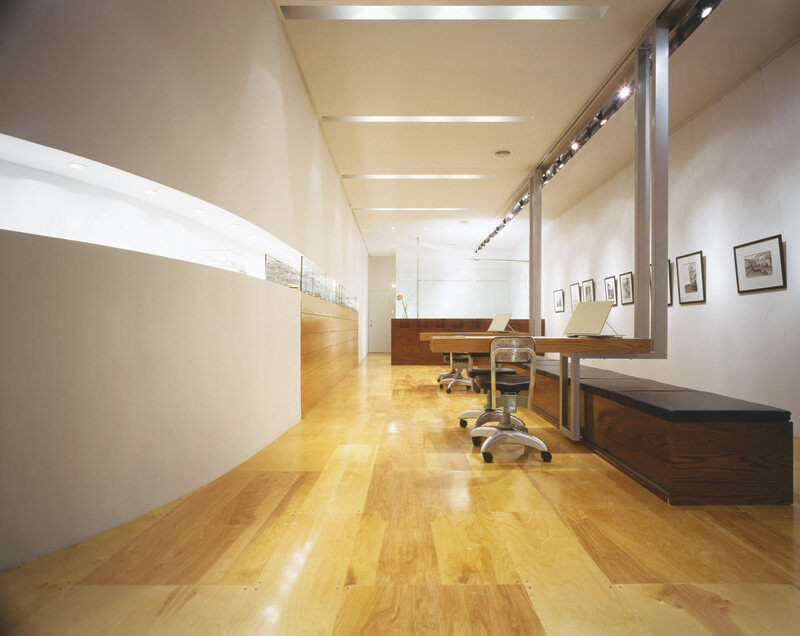 For gallery receptions they are drawn to either ends of the gallery and have the effect of expanding the space.